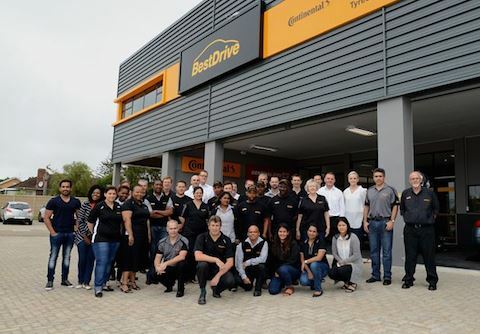 BestDrive has announced the official opening of its flagship store in Port Elizabeth. The tyre and automotive parts fitment service chain's new outlet is located in the bustling shopping and residential hub of Walmer and brings the established European and Asian leading brand into the forefront of the SA market. The company is a joint development of the tyre division of Continental and the corporation's trade division, ContiTrade. Kevin Slabbert, Head of Franchise at ContiTrade Africa comments: "Constructed as a greenfields operation, BestDrive William Moffett is our flagship fitment centre and our eighth equity operation in South Africa. It also fully compliments our world-class Continental Tyre manufacturing plant in Port Elizabeth. It represents the pinnacle of BestDrive quality and expertise, and headlines our growing network across South Africa, which will reach 150 fitment centres by the end of next year." "The tyre fitment industry in South Africa consists of many well established retail brands and independent retailers who have worked hard to earn the loyalty of local customers. However, with the increasing complexity of modern cars and their technologically advanced tyres, comes an expectation that the tyre fitment experience will match the sophistication of the product being purchased, and that's the market that BestDrive is developed for." The fitment centres are touted as providing the full range of services, including tyre fitment, rotation, balancing, wheel alignment and puncture repairs, as well as offering a comprehensive portfolio of automotive services. This extends to the fitment of top-quality brakes, shock absorbers, batteries, mag wheels and vehicle accessories - all of which carry nationwide manufacturer warranties. The product portfolio for service items includes Gabriel and Monroe shock absorbers; Safeline, Ferodo and Ate brakes; PartQuip Auto Parts, as well as the top battery brands comprising Sabat, Willard, Probe and Exide. Bosal and Tuffex exhaust systems are available, along with BTM bull bars and tow bars, the wide range of Thule roof racks, bicycle carriers and accessories. Customers also have the choice of a dazzling array of A-line wheels for all types of vehicle applications. With its close proximity to the Continental Tyre SA plant in Port Elizabeth, BestDrive William Moffett enjoys flagship status and includes a wide range of additional facilities and services. The site features professional in-house training facilities to provide technical and operational training, and is equipped as a proving ground to evaluate processes, procedures and other solutions before being rolled out to the franchise network. Its owners add that it will be used as a learning facility for Continental employees to experience and understand the retail business as part of their career planning and development opportunities.